We made our way through the mountains of northern Thailand towards the small city of Chiang Rai. We spent our three hour trek picking our driver Benz’s (@Fastdry) brain on his life in Thailand. We quickly grew fond of the kind hearted, intelligent man from the mountains. Our impromptu visit to his hometown, Wiang Kalong, left us feeling so excited to explore more of the magical Lanna Kingdom. 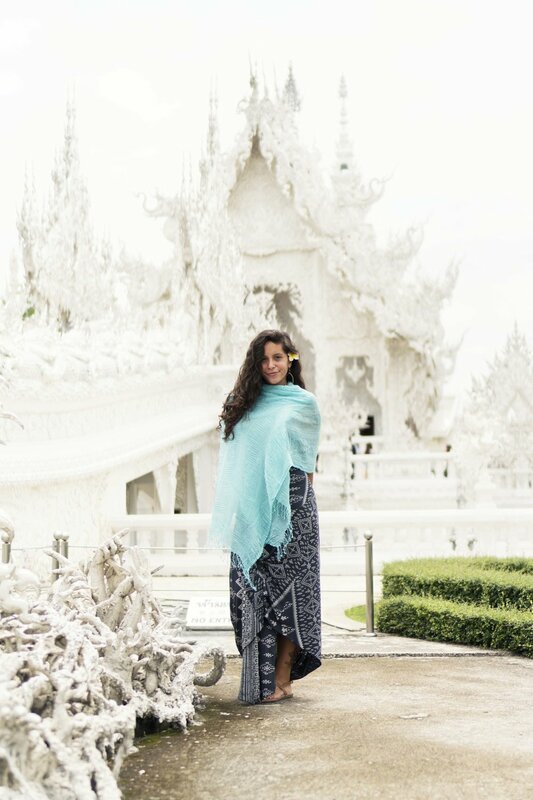 When we pulled up to the White Temple, I immediately felt like I had been transported to another world. 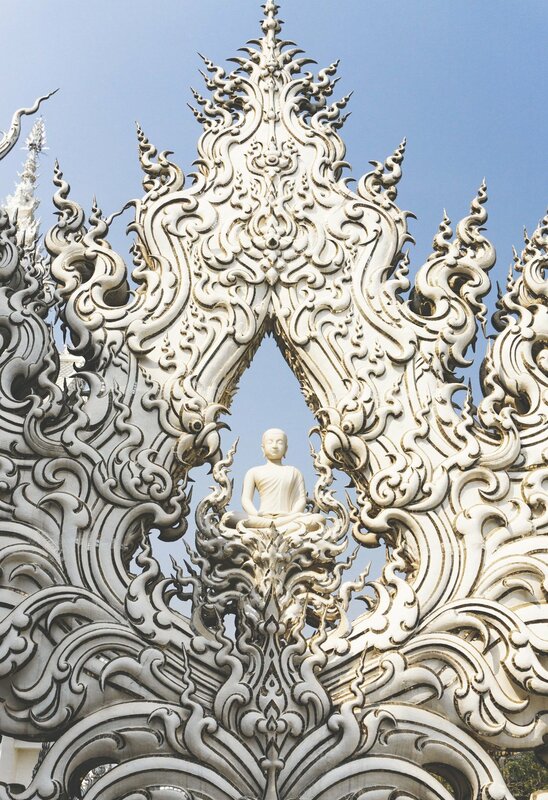 Wat Rong Khun, or the White Temple is one of the most recognizable temples in Thailand. 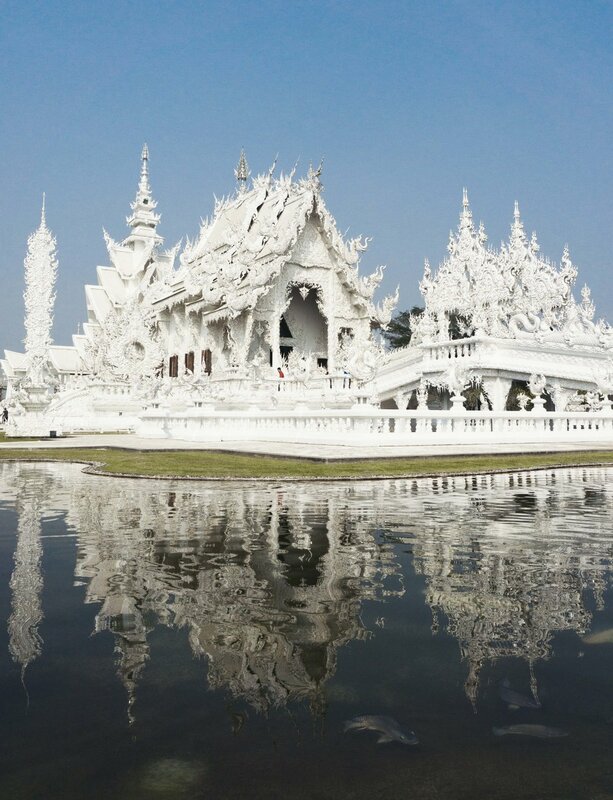 The white color and sparkling pieces of glass glittering in the sun attracts a large number of visitors daily, both Thai and Foreign. 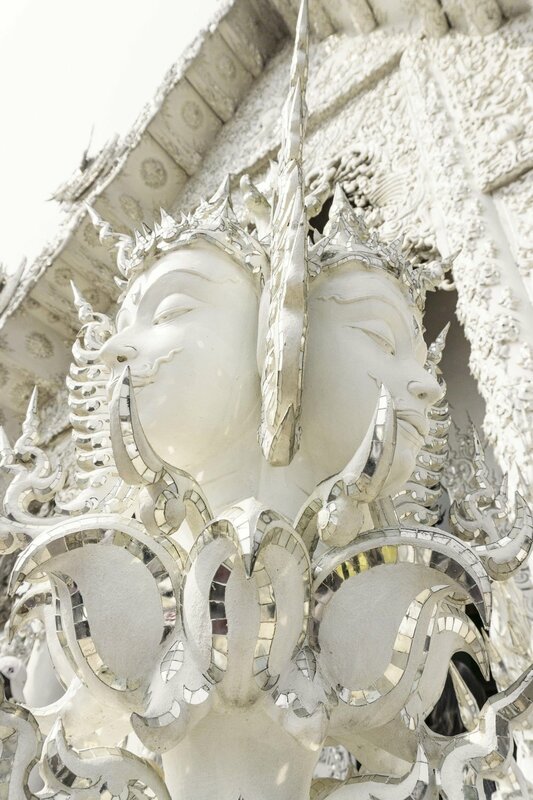 The white color signifies the purity of the Buddha, and the glass symbolizes the Buddha’s wisdom and teachings. 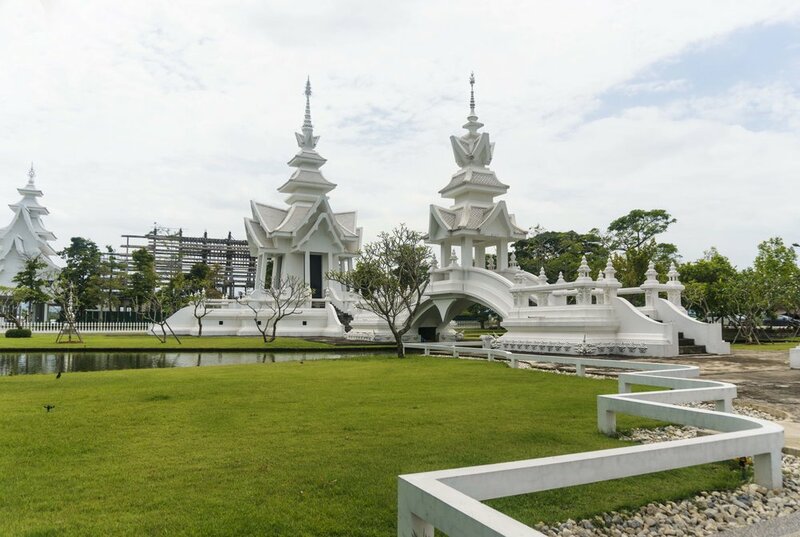 The White Temple was designed by a famous Thai visual artist named Ajarn Chalarmchai Kostipipat. He built the temple with help from over 120 of his disciples. On any given day, you will find him here at the temple, devoting himself to showing the world the glory of modern Thai Buddhist art. 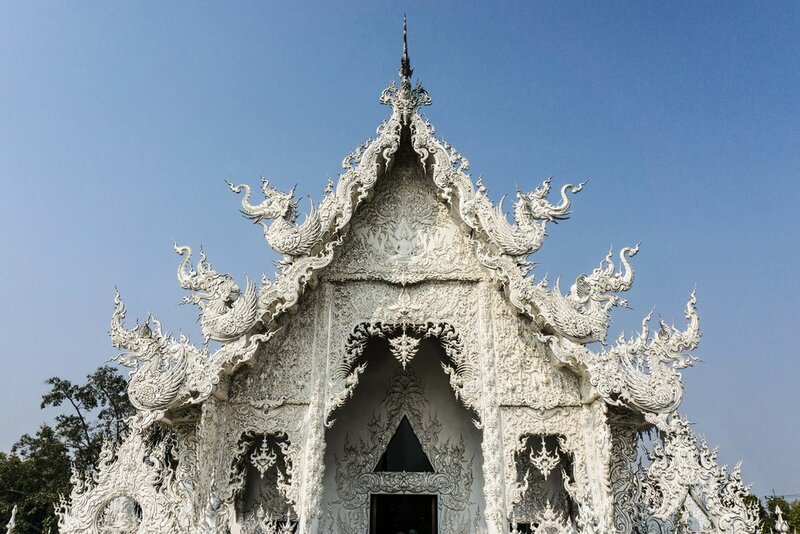 The building of Wat Rong Khun began in 1997, and is expected to take 90 years to complete. The temple is constantly being updated and added onto daily, so if you were to visit a few times a year, you will see something new every time. We were grateful to have Benz as our tour guide, showing us all the newest additions and prime photo ops. 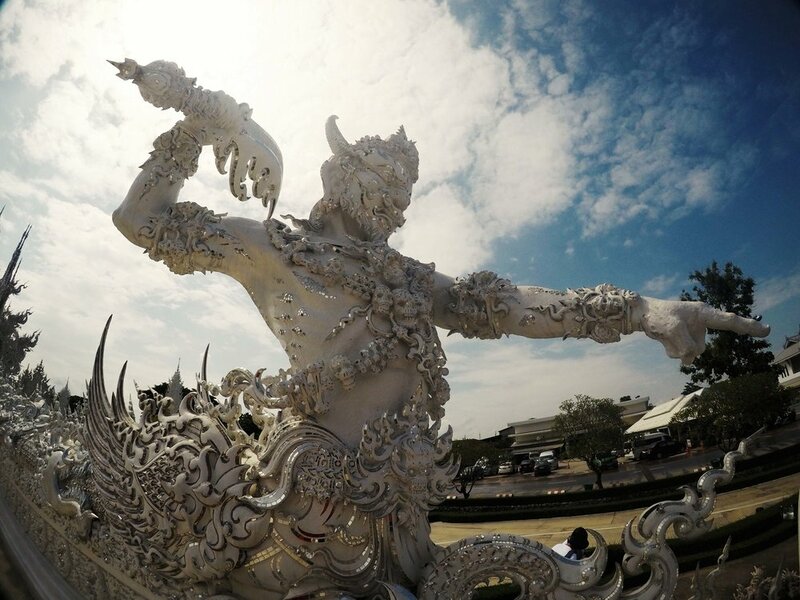 Chalarmchai has decided to take no donations or funding from the government to build the temple, to keep his artistic freedom alive, refusing to work under anyone’s influences. The artist studied Painting, Sculpture and Graphic Arts, with his ultimate goal being to become a great Contemporary Thai artist and to make Thai arts known worldwide. 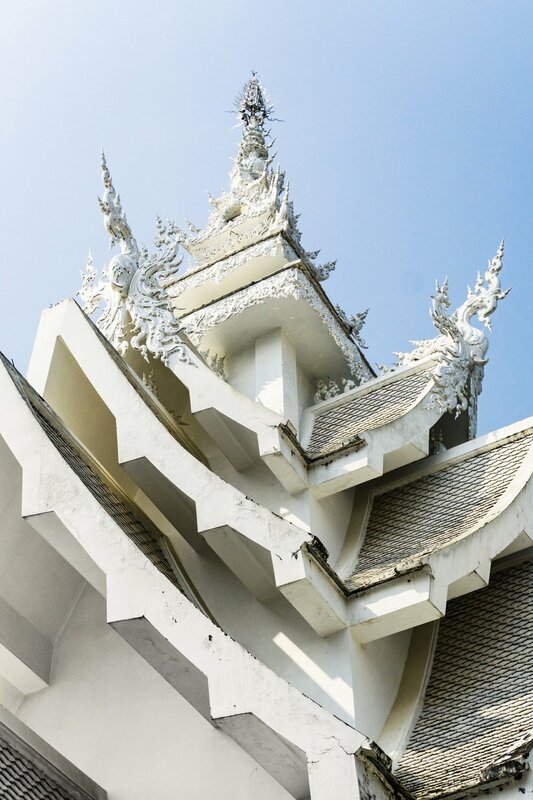 Every detail of the White Temple carries meaning and symbolism, and encourages the visitor to reflect on the teachings of Buddhism. When you enter, you will first cross the bridge called “the cycle of rebirth”. This is definitely one of my favorite parts of the Wat. Underneath the bridge, there is a sea of hundreds of reaching hands and skulls symbolizing desire, human suffering and hell. Crossing the bridge signifies the crossing over from the cycle of death and rebirth into a state free of suffering. 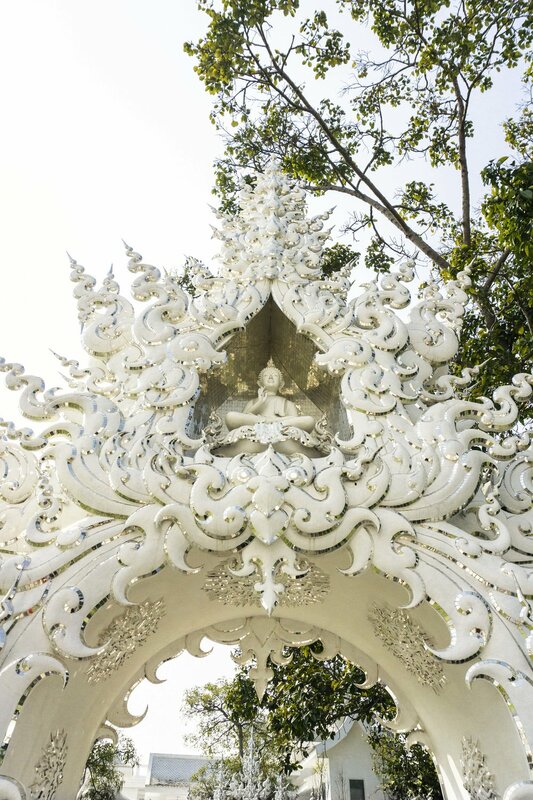 After crossing the bridge you will arrive at “The Gate of Heaven” before entering the most important building of the Wat, the ordination hall. No photos are allowed in this building, and it is where you can take a moment to pay your respect to Lord Buddha. 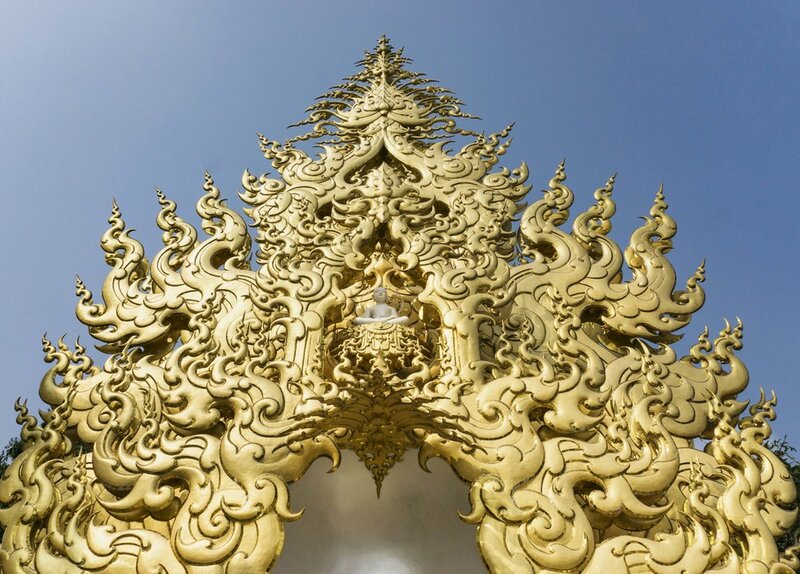 A few other important buildings to note is the Golden Building, which represents the idea to focus on the mind, instead of material possessions. Also, there is a crematorium which signifies the transition from this life onto the next. 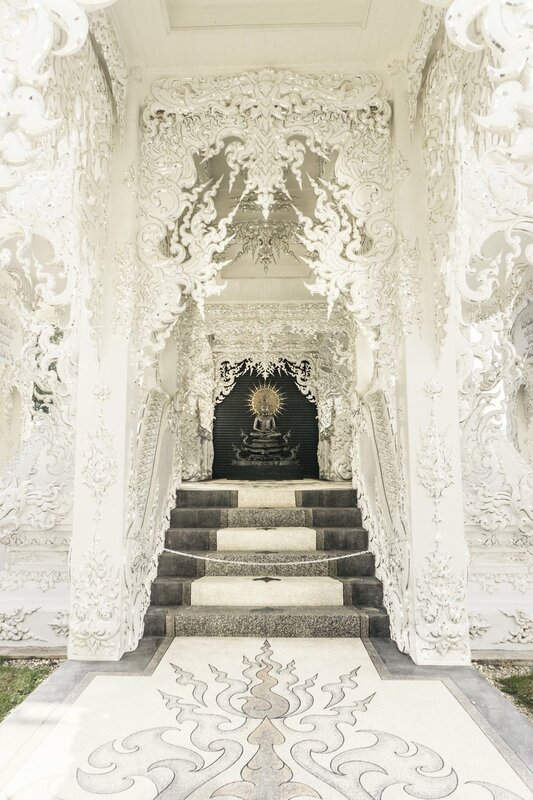 The White Temple is one of the most unique temples I have ever seen, and if you plan on visiting Chiang Mai it is definitely worth the 3 hour trek north to see this amazing piece of art. Admission to the temple is 50 BHT. We suggest visiting either early in the day or right before it closes at 5PM, to beat the heat and the crowds. If you ever find yourself in need of a trusted driver or tour guide in northern Thailand, we’ve got you covered. To hear more about our journey through northern Thailand, please visit our blog at chasedit.com.